Williamsburg, Virginia, also known as Colonial Williamsburg, is America’s largest interactive history museum, located just a few hours south of Washington, DC. The 301-acre restored 18th-century capital city of Virginia transports visitors back in time to the period of the American Revolution. Beating drums, trilling fifes, firework displays, theatrical programs and interpretive characters are just a few of the entertainment elements that are designed to spark your interest in 18th-century Virginia. From Washington DC: Take I-95 South toward Richmond, Take exit 84A on the left to merge onto I-295 South toward Rocky Mt NC/Richmond International, Take exit 28A to merge onto I-64 E toward Norfolk/VA Beach, Take exit 238 for VA-143 toward US-60. Follow signs to Williamsburg. See a map. 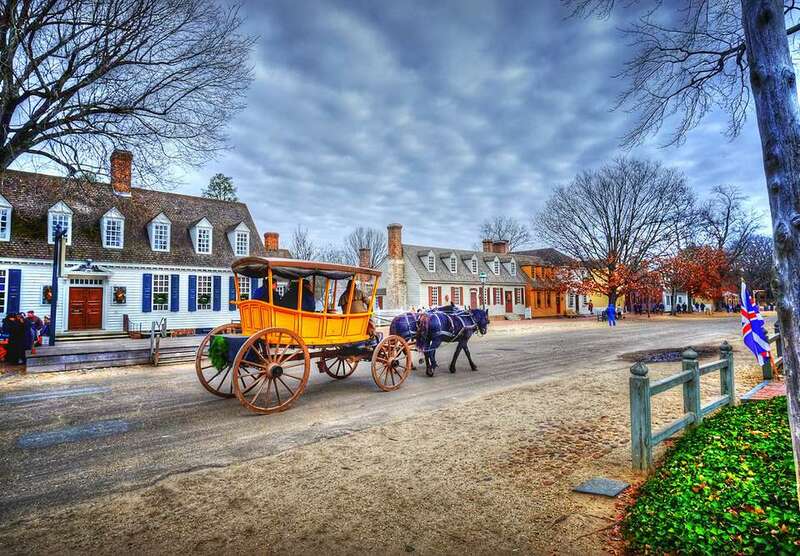 Plan to spend at least a full day in Colonial Williamsburg. Add additional days to visit Busch Gardens, Water Country USA, Jamestown Settlement and Yorktown Victory Center. Make reservations prior to arrival for evening programs and dinners in the Colonial Taverns. Be sure to bring and wear comfortable shoes. Cars are not allowed in the Historic Area, so expect to do a lot of walking. From 1699 to 1780, Williamsburg was the capital of England’s wealthiest and largest colony. In 1780, Thomas Jefferson moved Virginia’s government to Richmond and Williamsburg became a quiet country town. In 1926, John D. Rockefeller Jr. supported and financed the town's restoration and continued to do so until his death in 1960. Today, the Colonial Williamsburg Foundation, a private, not-for-profit educational institution preserves and interprets the Historic Area. The Historic Area of Colonial Williamsburg includes 88 original 18th-century structures and hundreds of houses, shops and public outbuildings that have been reconstructed on their original foundations. Peyton Randolph site - where historic trades carpenters are reconstructing Randolph's "urban plantation"
Abby Aldrich Rockefeller Folk Art Museum - 18 galleries are filled with paintings, embroideries, whirligigs, weathervanes, toys, dating from the 1720s to the present. DeWitt Wallace Decorative Arts Museum - collection of English and American antiques, including, furniture, silver, textiles, ceramics and more. Visitors can watch historic trade demonstrations and dramatic vignettes and participate in interactive programs with “People of the Past.” Tradesmen and women are professional, full-time artisans dedicated to specific trades, such as brickmaking, culinary, carpentry, apothecary, gunsmith and saddlery. Homes, public buildings and shops in the Historic Area are furnished with objects from an extensive collection of English and American antiques and reproductions made by Colonial Williamsburg tradespeople. Tours, evening programs and special events change daily. To truly experience the Historic Area, plan to take a themed walking tour or participate in live comedy, theatre, and musical performances. See the calendar of events. Some programs are an additional charge and require advance reservations. The holiday season offers wonderful programs for the whole family. See a guide to Christmas in Colonial Williamsburg. Hours are generally 9 a.m. to 5 p.m. but vary by season. The buildings and grounds are open seven days a week, 365 days a year. Tickets are required to enter the historic buildings and attend special programs. Single-day and multiple-day passes are available. You may wander the streets of the historic district, eat in the taverns and visit the shops without a ticket. To purchase tickets in advance online, visit www.colonialwilliamsburg.com. Busch Gardens - The European themed amusement park offers a full day of fun with dozens of rides and attractions, ten main stage shows, and a wide variety foods and shops. Water Country USA - The state-of-the-art water park offers lots of slides and waterplay opportunities set to a 1950s and '60s surf theme. Jamestown Settlement - The site of America's first permanent English colony is located just 8 miles from Colonial Williamsburg. Explore the Visitor Center, the Powhatan Indian Village and the Jamestown Settlement Ships. These hands-on exhibits are great fun for kids. Yorktown - On October 19, 1781, the American Revolution culminated with the British surrender at Yorktown. The living history center re-creates the Continental Army encampment with interactive programs. Williamsburg Winery - Virginia's largest winery offers daily tours and tastings. College of William and Mary - America's second-oldest college is also one of the best public universities in the nation. The Colonial Williamsburg Foundation operates five hotel properties that are located within walking distance of the Historic Area. Visitors passes are discounted for guests of these hotels. Williamsburg Inn - Regarded as one of the world’s best hotels, the inn was remodeled in 2001. Amenities include a top-notch restaurant, an outdoor pool, tennis courts, award-winning golf, and a spa and fitness club. The inn is located adjacent to the Historic Area. Colonial Houses - Authentic 18th century accommodations located in the Historic Area. Williamsburg Lodge - One of John D. Rockefeller Jr.'s original hotels. Woodlands Hotel & Suites - Newest hotel, moderately priced. Governor’s Inn - Economy lodging, 3 blocks from Historic Area. For more information or reservations, call 1-800-HISTORY or visit www.colonialwilliamsburg.com. The area has a wide range of accommodations, ranging from family friendly hotels and condominiums to elegant inns and cozy bed and bed and breakfasts. To find a place to stay that meets your needs, see goWilliamsburg.com. Market Square - The retail village adjacent to Colonial Williamsburg’s Historic Area, includes more than 40 shops and restaurants. This is a good place to purchase gift items and enjoy a meal or snack. Premium Outlets Williamsburg - The outlet shopping center includes more than 120 major brand and designer outlets such as Gap, Eddie Bauer, Nike, Jones New York, Gymboree, Ann Klein, Coach, American Eagle Outfitters, Bath & Body Works and much more. Williamsburg Pottery Factory - Find a huge selection of pottery, baskets candles, china, giftware and more. Take a tour and watch pottery being made.